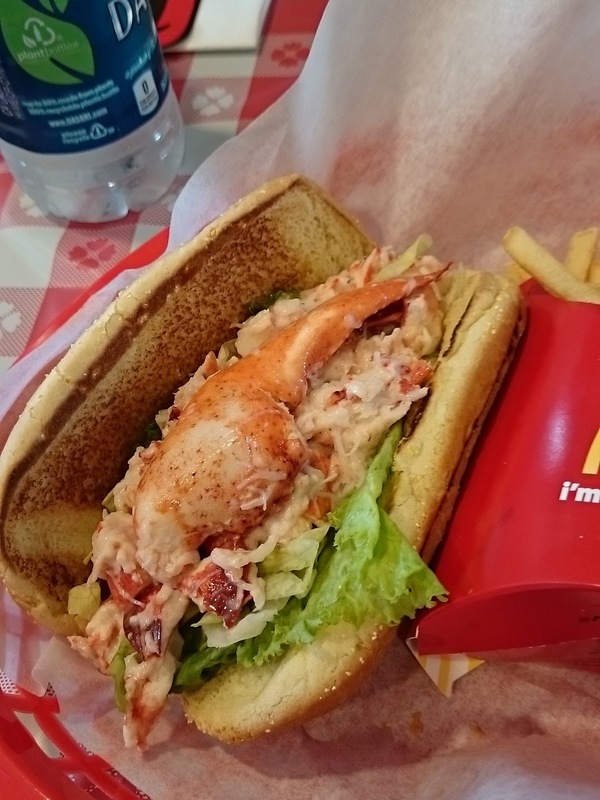 Lobster Rolls are Back at McDonalds! They're loaded with lobster meat, topped with a big juicy claw, and wicked affordable at just $7.99. 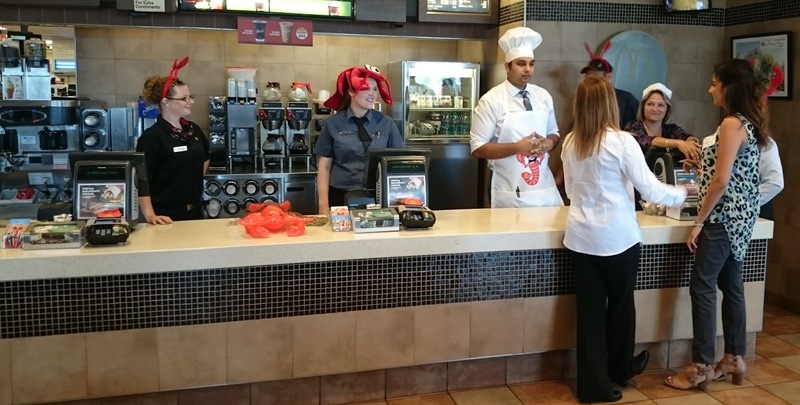 At the First Taste event I attended at my neighborhood McDonald's, the restaurant was decorated in cool and kitschy lobsters and the staff wore lobster claw deely boppers and other deepsea-bug-related headgear. 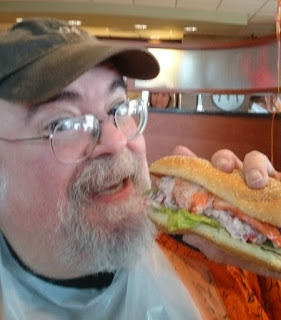 Take note, son: This is a real lobster roll and not some junky fast-food travesty. McDonald's starts with a nicely toasted club roll and beds it down with a blend of shredded and leaf lettuce. Then they take knuckle and flake lobster meat, dress it very lightly with mayonnaise, and top it of with a plump full claw. I know there is a huge controversy in the lobster roll world: Butter or Mayo? Buttery lobster rolls are generally served hot, and mayo lobster rolls are generally served cold. A lot of people have strong opinions on which is the "right" way to make a lobster roll. Throughout my life, I've had them prepared both ways. When I was a kid growing up in Massachusetts, my mother always made them with mayo. When I got out on my own and started exploring New England with my friends and later with my wife and kid, I learned about the butter variety. Today, I don't have a preference. My daughter Lynnafred grew up eating them both ways...and she does have a kind of preference: "Hot lobster rolls made with butter are for supper. Cold lobster rolls made with mayo are for lunch." Makes total sense to me. Anyway, even if you're not usually the type to get a cold-with-mayo lobster roll, you should give it a try at McDonald's this summer. They use the mayo sparingly, just enough to bind the meat, and never so much as to be gooey or obtrusive or to cover the flavor of the seafood. And the little bit of mayo they've got don't add that much to the calorie count, either. One of these lobster rolls comes in at just 290 calories. Yeah, these are pretty much exactly as I remember them from ten years ago, when we used to get them at the McDonald's right of I95 in Mystic (or the one on US1 in Wells, Maine.) I'm glad they're back. We missed them. mfw I have one of those lobster rolls. 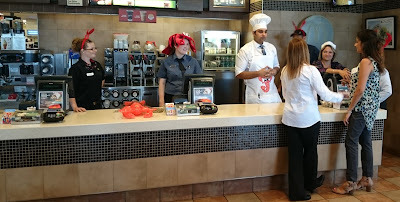 Special thanks to McDonald's of CT and WMass for inviting me to the tasting event.